Buy and hold was the first investing concept where the light bulb immediately went off in my head. It was elegant in its simplicity. There are no barriers to entry for this type of strategy. Anyone who has the patience and mental fortitude can invest this way. It has its flaws but so does every investment strategy. My ideas have evolved over time but the idea of long-term investing has always resonated with my personality type so it’s how I approach the markets both personally and professionally. One of my greatest influences on the idea of long-term investing was Vanguard’s John Bogle. 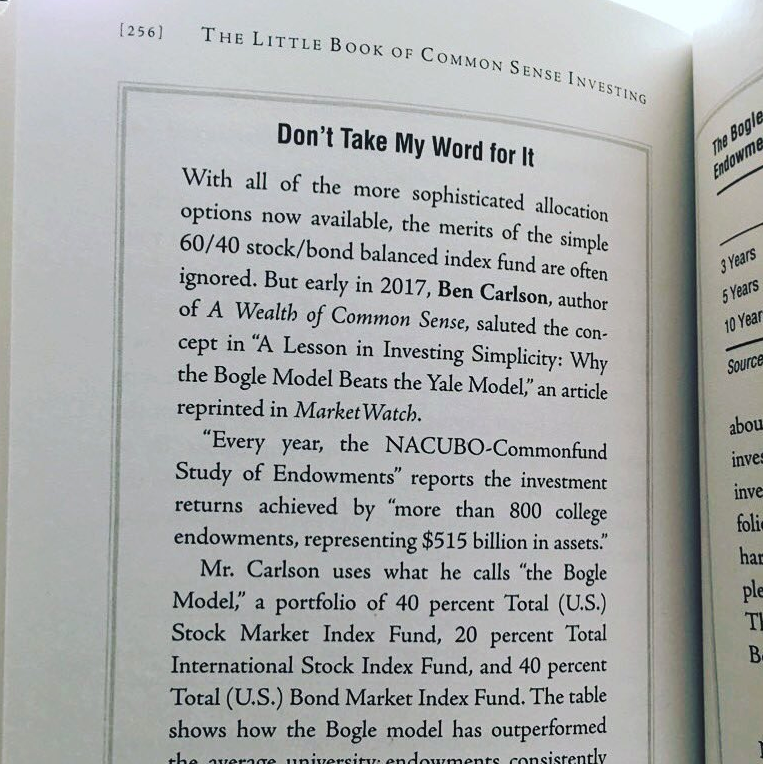 In 2007, I picked up a copy of his book The Little Book of Common Sense Investing. Because of my job at the time, I was so engrossed in the due diligence world of active money managers that I didn’t pay much attention to the idea of index funds. Then I read this book and the message hit me like a ton of bricks. It’s easy to ignore a simpler path when you operate in a world awash with complexity. I heard it through the grapevine that Bogle had read and enjoyed this piece but didn’t realize he would use it in one of my all-time favorite investing books. To say I was honored would be an understatement. This led me to pick up a copy of the newly released version which I quickly devoured this past weekend. I highlighted some of my favorite passages, which was a worthwhile review. Where returns are concerned, time is your friend. But where costs are concerned, time is your enemy. To repeat, while such an index-driven strategy may not be the best investment strategy ever devised, the number of investment strategies that are worse is infinite. In 1951, I wrote in my senior thesis at Princeton University that mutual funds “can make no claim to superiority over the market averages.” Sixty-six years later, that has proven to be a huge understatement. The perception of investors, reflected by the speculative returns, counts for little. It is economics that controls long-term equity returns; the impact of emotions, so dominant in the short term, dissolves. My own total portfolio holds about 50/50 indexed stocks and bonds, largely indexed short- and intermediate-term. At my age of 88, I’m comfortable with that allocation. But I confess that half of the time I worry that I have too much in equities, and the other half of the time that I don’t have enough in equities. The way to wealth, I repeat one final time, is not only to capitalize on the magic of long-term compounding of returns, but to avoid the tyranny of long-term compounding of costs. Avoid the high-cost, high-turnover, opportunistic marketing modalities that characterize today’s financial services system. While the interests of Wall Street’s businesses are well served by the aphorism “Don’t just stand there—do something!,” the interests of Main Street’s investors are well served by an approach that is its diametrical opposite: “Don’t do something—just stand there! Bogle’s thoughts and ideas are one of the main reasons I’ve latched onto the importance of common sense. The idea that “the stock market is a giant distraction to the business of investing” is one of my all-time favorite quotes. The book’s message is simple yet powerful. It’s a short read but the concepts presented are so powerful that novice and professional investors alike can learn something. This is probably the best book ever written for normal investors to help them understand how the markets and financial services industry functions. The idea of long-term investing is nothing new but it’s worth revisiting on a regular basis. The temptation of the short-term seems to grow stronger by the day.